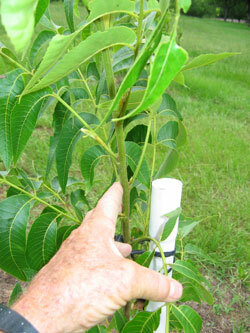 At Lakeview pecans, container grown pecan trees are propagated with known grafting material, onto growing rootstock after two years growing in containers. 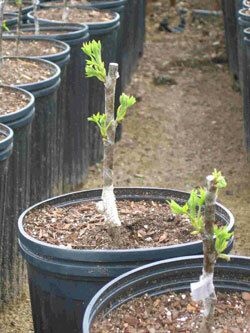 To insure variety integrity, mature orchards at Lakeview provide almost all grafting material used for propagation. 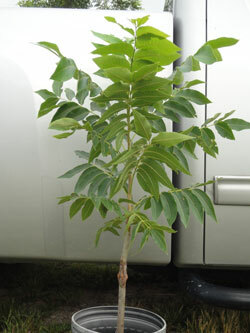 Establish two-year old rootstock helps to insure a strong root system and viability. Ample water supply provides for irrigation as needed. Daily monitoring of root-zone moisture prevents over watering. 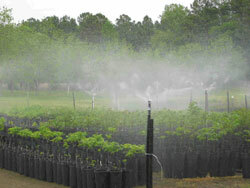 Irrigation system provides for foliar application of fertilizer or pesticides. 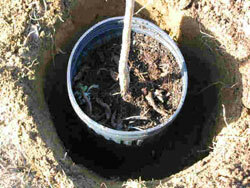 Grafted trees are typically grown in 5-gallon containers. 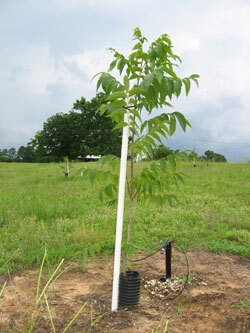 Trees reaching a minimum of three feet in height are most ideal for transplanting. A Nurserymen's objective is to develop a strong root system and to insure the graft union is well healed. 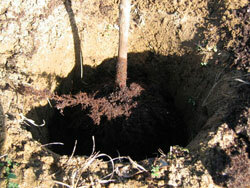 Planting one and two year grafted trees reduces the risk of the trees becoming root bound. Transplant hole should be twice the width of the rootball. If hard compacted soils, hole should be about 6 inches deeper than rootball. Tree should be planted same depth as soil in container. It is very important that a tree is not planted too deep or too shallow! Generally, trees are very easily removed from pots. Place tree in center of hole to accommodate root spreading. Loosen soil and spread lateral roots as hole is being filled. When hole is about two-thirds filled, apply about two gallons water to firm soil to remove air pockets. Continue filling the hole and firmly tamp, avoiding breaking of feeder roots. Generally, fertilizers nor lime should be applied in planting hole. When soil analysis clearly show that soils are significantly under nourished, small amounts of lime and fertilizer in the planting hole may be needed. Leave slight depression around tree to facilitate watering. Place collar around tree as herbicide protection. Collar should remain for 3-4 years. A vegetation free zone should be maintained around the tree. If mulch is applied, limit to no more than three inches of decayed matter, pine straw, etc. Ideally, two-thirds of tree height should be in canopy. Trees need to be supported for the first several years to support the expected rapid growth. Half-inch conduit will be sufficient. Vertical growth should be limited to 12-18 inches annually, for the first four years. Removal of excessive growth will divert energy to caliper development. On healthy growth, the topmost bud will quickly break and become the new central leader. Container grown trees grow rapidly, reaching 2-3 feet of new growth each year. Trees should be supported during their first few years for protection from strong winds. Trees should be lightly fertilized (single handful of 10-10-10) first of April, May, June and July for the first 2-3 years. After that, fertilization should be based on soil test results. If that is not done, then apply one-half pound of 10-10-10 per inch of trunk diameter. Soil moisture is very important for the first five years from planting. During periods of drought stress, apply approx. 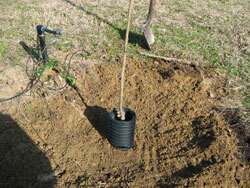 three to five gallons of water to each tree weekly, depending on soil composition. If soils are sandy through the root zone, more may be needed, if soils are mostly clay where leaching does not occur as rapidly, less will be needed. Do not over-water. Trees can drown. Tree roots need oxygen in addition to water. A thorough saturation of root zone once a week is sufficient.